I would posit that the greatest problem holding back education is our tendency toward building silos. Worse, we have myriad reasons to convince ourselves that their construction is “the right thing to do.” This often has the effect of making our separations invisible to us - prisons of our own design. If we are to move forward as a profession, it will be through a strong collaboration that doesn’t exclude or separate any of the parties that have a stake in this work. One of the bright spots in this struggle is the forum of the State Educational Technology Directors Association (SETDA), which Candice and I attended this past week in San Antonio. These representatives from each state are some of the most experienced individuals in educational technology, and their gathering is coveted by savvy, education-focused businesses hoping to get some feedback about their products and market strategy. The reason we convene is to combine our efforts, to collaborate with one another to tackle the larger problems that we each struggle with: building a strong infrastructure, using data in meaningful ways, and navigating the digital transformation. For this brief moment we discuss our hurdles, share our perspectives, and welcome businesses as teammates in our efforts. Control. Aren’t we control-minded? As a teacher I was expected to be in control of my class and my content, and as an administrator the responsibilities multiplied exponentially. We tend to build our walls around those things we are responsible for, excluding that which is beyond our control. Teachers shut their doors, principals focus on their schools and state leaders highlight their boundaries on the map. Business is certainly not immune to the control affliction. In one session, a company representative shared their reasoning for not allowing content to be imported into other systems, saying: “we feel it really works best inside our platform.” And, of course it does. But does that justify the silo you have built, making it far more difficult for others to connect with it? Compartmentalization. This almost sounds redundant, but it is the particular affliction of entities that have become too big for their own good. It is the fragmenting that happens when groups become too large to talk to one another, or their subgroups become so specialized that they fail to understand the work of other groups. One company we spoke with had acquired several smaller businesses, covering so many facets of education that their work was spread across half a dozen divisions within the company. They had become so vast, that members in one division were attempting to create solutions that already existed elsewhere in the company. In schools our biggest fragmentation often happens when leaders of curriculum and technology haven’t realized that they are working toward the same goals. We too have the communication issues, traveling hundreds of miles for that rare conference opportunity where we may finally talk to the teacher who was just down the hall. Competition. There are also a number of forces that are attempting to convince us that competition is the cure for modern education. In truth, since a modicum of competition seems to cause schools to treat students more like customers and less like a captive audience, surely not all competition is evil. But competition is the antithesis of collaboration. Taken to the extreme, it will diminish the sharing that is so vital to our practice. If we follow the business model to the point where schools protect their best practices like trade secrets, then the disparity amongst our schools will only increase. The cure for these, as I’ve learned at the hands of a couple of brilliant mentors, is something best described as Connectability. 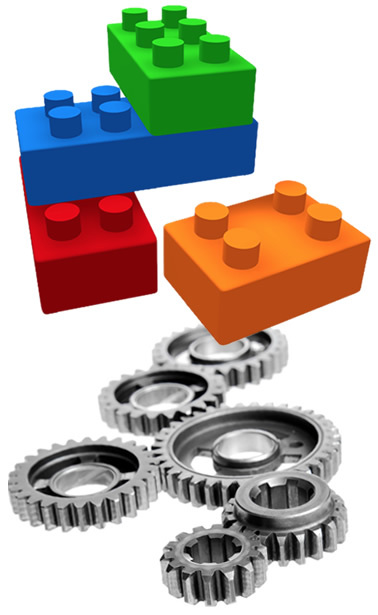 Akin to interoperability, connectability is a measure of how open you are to collaboration, team efforts, and true partnerships. It means that at your edges, like the teeth of a cog or the bumps on a building block, provide an easy way for people to connect with what you do. You identify forces that are engaged in the same work and find a common ground where you can join forces. And in very simple terms, it means that you don’t choose systems that fail to play nice with others. Strong movement requires momentum, and momentum will not come from a collection of isolated efforts. It comes from people relinquishing a measure of control and saying that we can agree on the best way to move forward. We are at a crossroads on a number of issues in education… common core standards, assessment consortia, digital conversion, broadband access - to list a few. With more of us across the country facing the same obstacles, will we each build our own ladder? Or will we choose to help one another over the wall? Are you pushing forward alone? Or will you choose to be connectable? This week, just beyond the buzz of the Summer of eLearning, #INeLearn team members attended two of the three math summits scheduled for June. These day long events were the DOE's invitation to open dialogue on math topics such as standards, assessment, the instruction delivery system and earning credits. On Monday, K-12 educators joined higher-ed and industry leaders in Plymouth and on Thursday, the same occurred in Huntingburg. This is one of the first of many projects that the eLearning team will be collaborating on now that we are members of the larger College and Career Readiness Curriculum team. Superintendent Ritz greeted each summit group and spoke to "The System: When Challenges become Opportunities" between guest speakers who set the stage on "Perspectives on Mathematics in Indiana and the Nation" and "Painting a picture of the IDEAL Indiana math graduate." Attendees didn't linger over morning coffee and donuts, rather they were immediately up and engaged in discussions around ideas that were gleaned from shared resources. More importantly, their rich conversations were captured throughout the day in both mind-alike and mixed group collaborations. 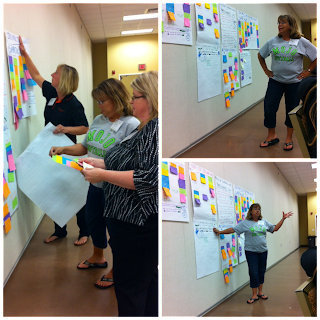 As the day concluded, charts speckled with colored post-its representing various stakeholders (elementary school, middle school, high school, higher education, school administrators and business/CTE members) filled the meeting space walls. Teams had spent the day listing essential elements around the ideal, pulling realities from the data, merging the two lists into common themes and drafting statements about each theme. It sounds like a lot of work, and it was. But as the team representatives shared what their group deemed the statements that would best increase the ability of schools to graduate a mathematically literate population, it was evident there was passion for this work in the room. As I confessed to the groups I facilitated, I am a fish out of water when it comes to discussing math instruction. (I am one of those language arts people.) Fortunately they allowed me to stay in the room and I discovered that much of the conversation taking place could be applied to other content areas and learning in general. In fact, when the mind-alike group drafted their picture of the ideal math graduate, the first two things they focused on were the characteristics of confidence and resourcefulness. Sure, they talked about algebraic functions and quantitative reasoning, but they did so in the context of student ownership of learning and the need to teach conceptually. Both groups' broader discussions touched on the skills needed for the 21st Century educator and student-thoughts that were on the back of my mind as they were the scheduled topics for our weekly #INeLearn Twitter chats. The team I worked with for the bulk of the day even tolerated me dragging them into the noon #INeLearn chat as we took a lunch break--thanks again Team A! Registration is closed for the final summit as the Indianapolis event is at maximum capacity, but this month's work is just the beginning so watch for new opportunities to engage in the ongoing dialogue. After Riding the Wave in Lafayette, we traveled South for our fifth stop in the Summer of eLearning to Heritage Hills High School in Lincoln City for the intEgrate conference. This is the second year North Spencer School Corporation has opened its doors to all teachers wanting to discover why, what, and how to integrate technology into the core of their curriculum. We spent the morning meeting teachers from Southern Indiana over breakfast and deciding on our sessions for the day. We dove right into learning and I joined a full house to learn all about student collaboration using Google Drive from Tim Jacobs. Next I stopped in with Tama Rickelman who was sharing some great tips and tools for online collaboration. The group really saw the value in Socrative in engaging students for discussion and for assessing their ideas and knowledge. Educreations let the group find a place to easily create a lesson that used both video and audio components. 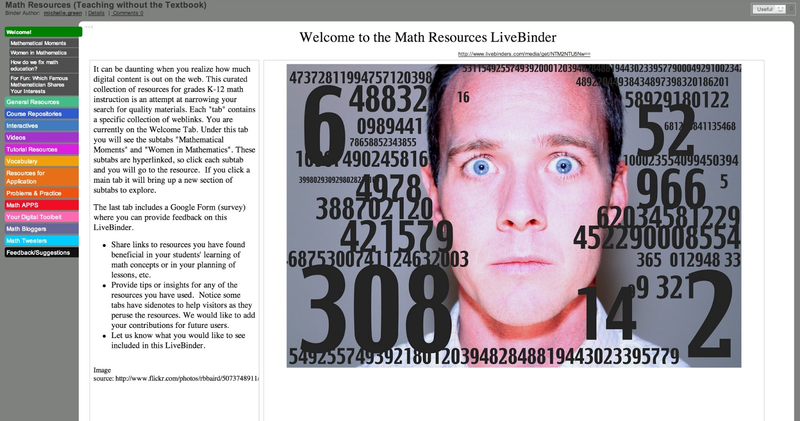 This works on the iPad, Chromebook, and other devices. Tama ended the session with Voicethread - a great place for conversations and learning recorded and shared in the cloud. After the first round of sessions we gathered in the auditorium where we were welcomed by principal Chad Schneiders. 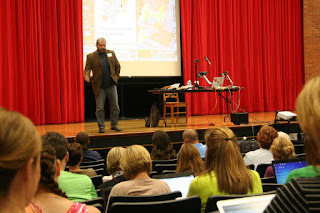 After some housekeeping we settled in for the keynote speaker, Kevin Honeycutt. Its hard to capture here the impact that Kevin has on his audience. He informs, challenges and inspires everyone with his stories and examples of how to "launch" students. He empowered us to tell our stories. He believes, "teachers are dying of humble." Other people are telling our stories. He implored us to take the time to tell about the students who are being transformed in our classrooms. Kevin mingled his own story of growing up challenged by poverty with examples of the teachers and opportunities that saved him. As an audience we were brought to both tears and cackles as he modeled that technology is great, but it won't do anything without relationships. 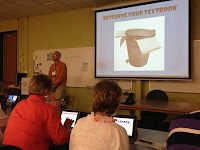 Some of my other takeaways... be a tradigital teacher - bring together traditions with digital. Empowerment comes from being trusted to attack learning according to your own strengths. Emotion cements learning. And by far the mantra that I will honor from Kevin is, "learn to love to learn." Kevin ended the session showcasing how technology can honor our passions with a jam session featuring our very own Jason Bailey. Lafayette's Tecumseh Junior High School welcomed Superintendent Ritz to a media center packed with more than 400 educators in attendance for their Ride the Wave of eLearning conference. She began by sharing a personal update on the things she's been working on, such as building a system of outreach, planning the future of assessments, and redoing the A-F accountability system. The superintendent drew strong applause for this work and for her statements about equity, stressing the importance of getting to a place where all students have wi-fi access and devices for learning. For their keynote, Tecumseh sought a true practitioner and found him through social media. Chris Wejr is school principal at Kent Elementary School in Agassiz, BC where he also maintains a website called The Wejr Board. His vision for the evolution of education centers around collaboration, rather than competition. Chris shared part of this great piece from John Seely Brown as a picture of this collaborative learning (and it fit right in with the Wave theme!) 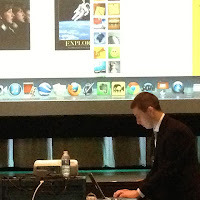 His presentation was full of examples where social media has connected learners to powerful result. One of the popular sessions was John Wolf's tour of the Learning Connection. 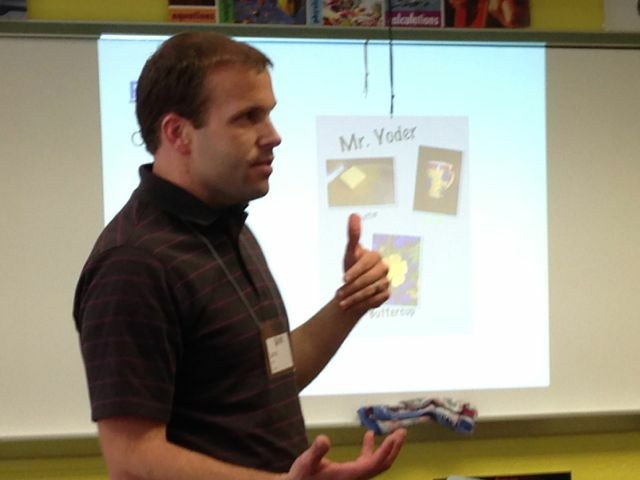 John is the Literacy Specialist at the Indiana Department of Education, where he has supported teachers for more than ten years. His communities in the Learning Connection provide resources and support to more than 16,000 teachers. In his session John helped participants connect with standards and resources in groups like Curriculum and Instruction, saving those resources into their own libraries. MentorMob for curating 'playlists' around a concept. A great model for keeping professional development engaging, Brett had participants vote for their favorite tools and planned to explore those in-depth during a later session. There were so many great sessions in this two-day conference, as evidenced by the lively Twitter conversations at #elwave and #INeLearn. Check in to take advantage of the resources being shared there, and we'll see you at our next stop on the Summer of eLearning! The Summer of eLearning is in full swing and today we visit MSD WashingtonTownship's LTEC: Reimagining Student Literacy conference at Northview Middle School. This is the first year for the LTEC conference which focused on digital literacy, individualized instruction, and harnessing the power of technology to educate students and enhance instruction. 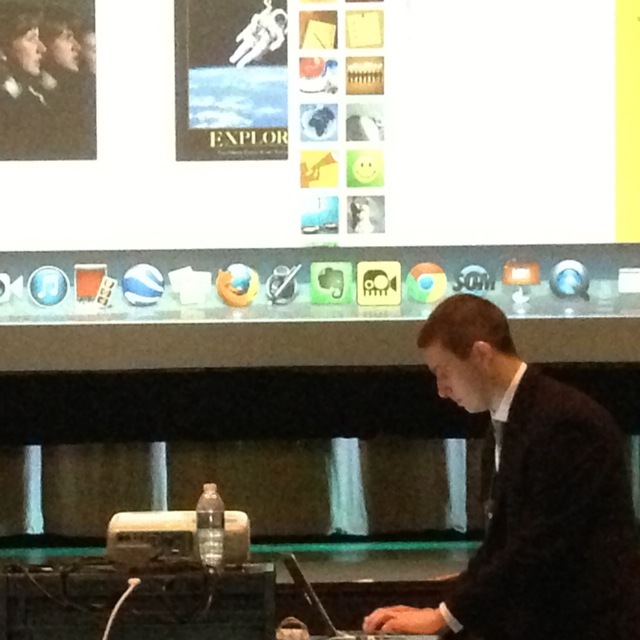 The morning kicked off rocking the auditorium with music and a welcome from conference coordinator Seth Hamilton. 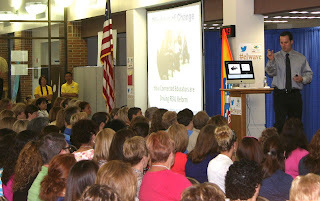 Keynote, Jim Klein, @jnetman1, challenged our thinking with his presentation: Making Learning Irresistible. What if? What does it mean? How might we? These are Jim's questions that should lead our thoughts around what teaching and learning can look like in our schools. He prompted us to consider what purpose technology affords us in an educational space. His answer: personalized learning, authentic tasks, and ownership of the learning by students. Jim's presentation showcased samples of teaching and learning that focused on content, composition, construction, and community. Follow more of Jim's thoughts on his blog: The Open EDge. My first session explored how technology is being used in authentic projects for world languages with Stephanie Schroeder, teacher from North Central High. Spanish infomercials planned, filmed, edited, and published utilizing iMovie and YouTube engage the students while implementing their Spanish. Students continue to integrate technology creating digital books of their life that brings pictures, text, and narration together. Finally Stephanie shared student created original legends created using Bit Strips for Schools. 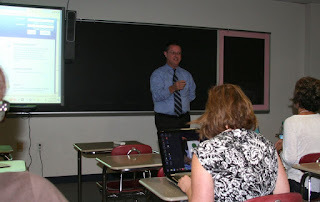 Next, I joined a full room of educators learning from James Tutin, who was "Getting the Most Out of Technology" with a variety of applications to use in the classroom like Animoto, Skitch, Glogster, Screen-o-matic and Tagxedo. Collaborative discussions helped everyone find new uses for these and other tools to engage students. Next week will find the INeLearn team Riding the Wave of eLearning at Tecumseh Jr. High School in Lafayette, and then intEgrating with educators at Heritage Hills High School in Lincoln City. Hope to see you in person this summer or virtually at #INeLearn! 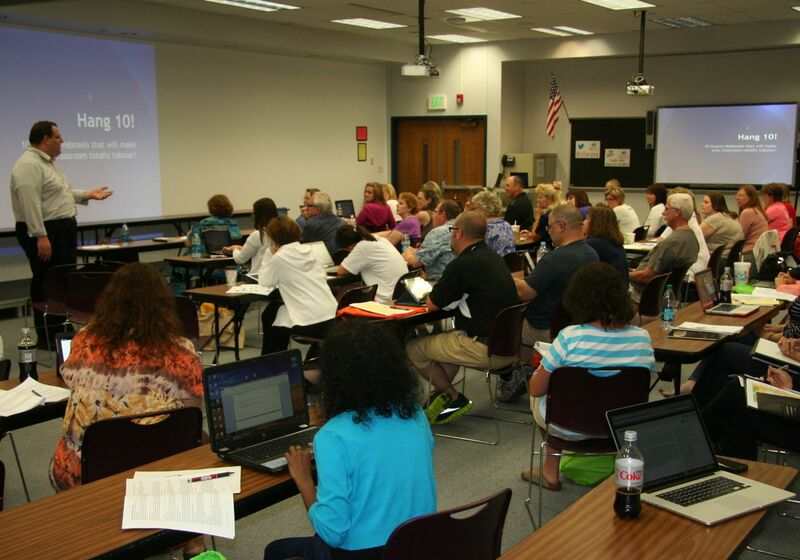 The second conference in the Summer of eLearning is being hosted by a district that continues to accumulate recognition for their work in connecting learners. East Noble's experience with technology integration made them a signature district of the renowned Project Red, and their leadership team just received CoSN's Excellence in Vision award. Given their success, the KTT 3.0 conference was a great place to learn about what they do well. 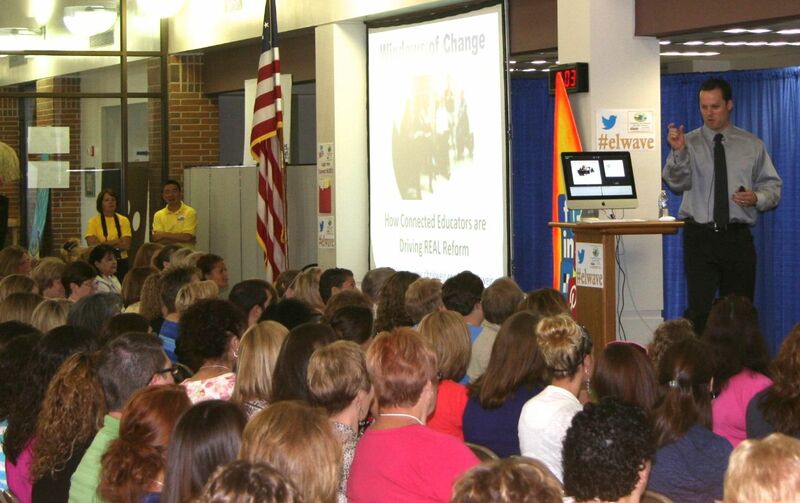 East Noble began their two day conference with keynote Richard Byrne, well known for his presence on Twitter as well as his blog: Free Technology for Teachers. Richard pointed out how Wikipedia is impacting research, and why WolframAlpha makes math teachers ask new questions. 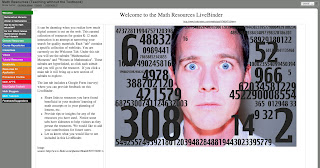 Among his list of resources he highlighted 47 alternatives to YouTube for classroom use, as well as great ways to give students a voice through technologies like Todaysmeet and Socrative. In a follow-up session, Richard also demonstrated examples of using Padlet with students as a collaborative space to share content of all types. Richard's concurrent sessions faced some real competition from all of the fantastic presentations being delivered by East Noble staff! Lindsey Ravis shared some of the 21st Century projects her students are engaged with using animation tools like Xtranormal, Pixton, and Go!Animate. Lance Yoder showed how elementary students are also project focused using apps like Pic Collage and Skitch. Digital storytelling is a great way for students to evidence their learning in a graphic format, and the explosion of free apps and websites for this purpose is really increasing our capacity for creative student projects. Fortunate administrative participants also got to learn from East Noble Superintendent Ann Linson and the fantastic members of her administrative team. They are passionate about helping students become successful digital citizens. The dedication of this leadership team has nurtured a tremendous culture conducive to eLearning, and that attitude is evident in their decisions like not buying textbooks and letting students take their devices home for the summer. 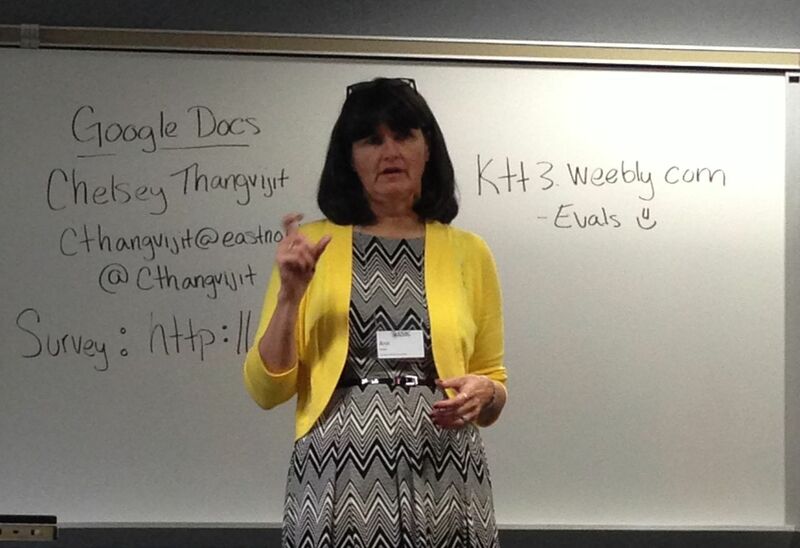 For more learning from Knight Time Technology 3.0 check out #KTT3 and #INeLearn on Twitter! The first stop in the Summer of eLearning tour is Center Grove's iPossibilities conference. 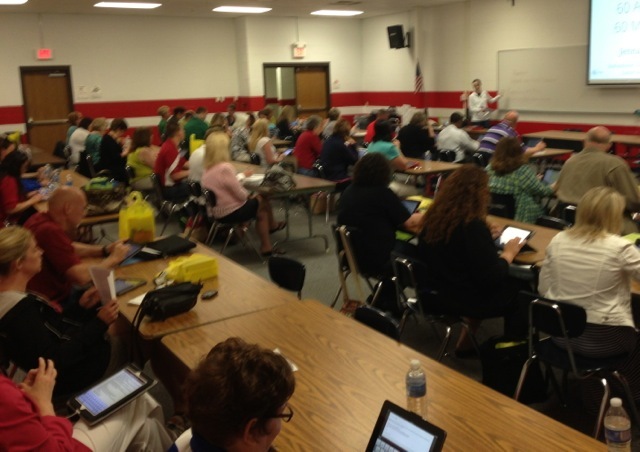 Repeating on last year's success, the team at Center Grove put together another great day of iPad-centric learning opportunities. Keynote Kathy Schrock kicked off the day with a talk she calls H.O.T.S. for Blooms. In one of her examples, she demonstrates how students with an iPad and one app called Explain Everything could participate in activities at every level of Bloom's Taxonomy. Next I checked in with Matt Miller from Turkey Run for his session with the perfect title: Ditch That Textbook! Matt ditched his textbook 5 years ago and hasn't looked back. Instead of being consumers, his students are discussing, creating, and blogging. Moving the textbook out seems to have made room for things that personalize the content for his students, like creating memory hooks (mnemonic devices) to help remember vocabulary. Could you name 60 apps in 60 minutes? Center Grove's Instructional Technology Specialist, Jenna Cooper can! In her session she shared her list of app suggestions that she's found through the years. The participants in this session were particularly impressed with CloudOn, a free app that gives you the potential to edit your Microsoft Office documents as well as a connection to documents in your other cloud storage like Google Drive or Dropbox. 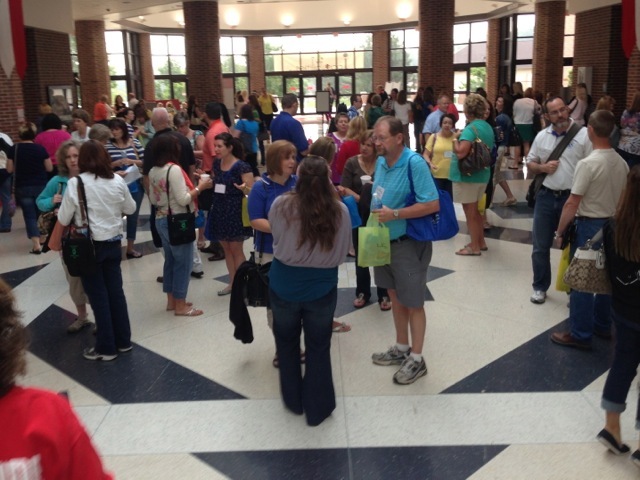 Check out the tweets from other Center Grove sessions at #cgipad13 and from other conferences this summer at #INeLearn. Stops next week include East Noble High School, and Northview Middle School (Washington TWP). See you there!